Experience authentic Catalonia's rich cultural and natural beauty on this short break holiday walking from the foothills of the Pyrenees towards the Mediterranean. Walk past extinct volcanoes, beech woods and ancient farmlands to medieval villages and towns. Your walking holiday starts in Olot, in the foothills of the Pyrenees, and an ancient volcanic land called La Garrotxa. This region has over thirty extinct volcanoes, now covered in woodland and vegetation. Olot itself is an historic town, with colourful old buildings in the streets around the centre and a selection of cafes and bars. Our hotel of choice here is a family run hotel with a private garden area and swimming pool, on the outskirts of the town. Your first walk is in La Garrotxa Natural Park, a great introduction to this area. You will be taken by taxi to the visitors centre at Fageda d'en Jorda. From here you follow a trail through protected beech woodland, past long extinct volcanoes including the striking crater of El Croscat, back to your hotel in Olot. Your first walk covers 16 kilometres and takes approximately five and a half hours. The total ascent and descent is +365m / -500m. Today begins with a taxi ride (included) to the medieval town of Santa Pau. The town centre has some interesting buildings including a castle first mentioned in documents dating back to the 10th century. From Santa Pau you follow the GR-2 long distance path through the Ser River valley and across rolling hills before finally descending to the beautifully preserved medieval town of Besalu via the famous 12th century bridge over the Fluvia River. The town's historic centre features arcaded streets and squares, a church consecrated in 1003, a restored Jewish bathhouse (kimveh) dating back to the 11th - 12th century, and a medieval synagogue down near the river. Our hotel of choice here is a centrally located, small, historic hotel. The walk today is shorter than previously, the trail first passing through fields then follows the River Fluvia where there are numerous swimming spots, and restaurants where you can stop for lunch. After a taxi ride back to Besalu (included) you will have time to further explore this interesting town. The walk today is 10.5 or 14 kilometres depending on route and takes approximately three or three and a half hours. The total ascent and descent is +175m / 160m. Your trip ends today in Besalu, after breakfast. During the day you will mainly need lightweight, breathable shorts and shirts. However light rainwear may be needed at any time of the year, and a warm fleece/ jacket is recommended for cooler evenings and nights early and late in the season. In July and August temperatures can reach 30°. April and May are the months with the most rain. Well worn, sturdy walking boots / shoes with good ankle support are essential for the walks. Sandals and trainers are recommended for relaxing in the evenings. Bring one main piece of baggage as per your airline luggage allowance, maximum 20 kg per person. Remember you are expected to carry your own luggage during transfers by public transport so don't overload yourself. Luggage transfers between hotels are normally arranged by the hoteliers. Mark your bags clearly and leave them at the place and time arranged with them. When travelling on public transport or on a ferry you should always take your luggage with you. A water bottle, sunhat and sunscreen are all essential and you may wish to bring a small torch. Walking poles are recommended. NB City Taxes maybe applicable. These are payable locally to the accommodation owner and vary from place to place. Generally this tax is up to 2€ per person per night. The nearest airports are Girona and Barcelona. Barcelona has more flights and is served by budget (including EasyJet, Ryan Air, Norwegian) and charter / scheduled airlines (including Monarch, British Airways, Vueling). Girona is served by fewer airlines including Ryan Air and Thomson Airways. At the start of your trip you can fly into Girona or Barcelona. Train service on Cercanias / Rodalies trainline R to Passeig de Gracia, a five minute walk from the Teisa bus stop. Trains run every thirty minutes from 05.40 to 22.30. Travel time is approximately thirty minutes. From Besalú you will take the bus first to Girona city centre (It goes every 2hrs, the bus company is Teisa; www.teisa-bus.com ; travel time 1 hrs: costs 5 euros). From Girona Bus Station you can take a shuttle bus to the airport (Sagales) Departures every hour from 05.00 to 19.00hrs (in summer from 05.00 to 23.00hrs), travel time aprox. 30min. www.sagales.com. The approximate cost is 2.75€ per way/ person. Alternatively it is possible to book private transfers both ways for both Girona and Barcelona airports. Please ask Explore for details. On this journey you walk 44. 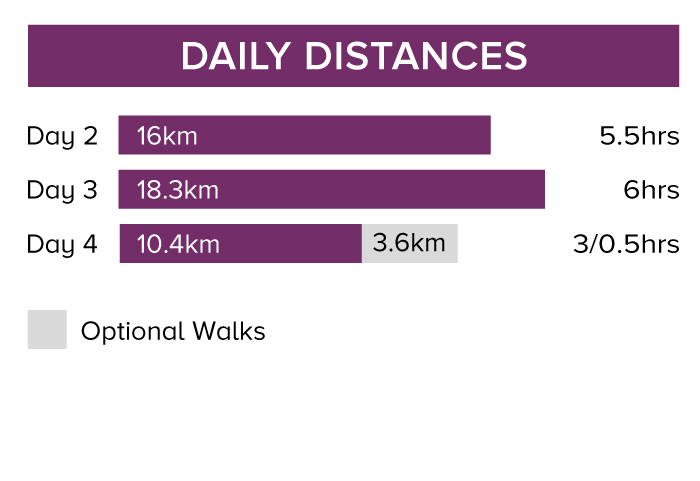 7 km over 3 days (an average of 15 km per day). On this tour 90% of the walks follow dirt roads and wide tracks (hard-packed gravel or sand) with gradual ascents and descents, with a few exceptions (shortcuts along more stony trails). We have graded this trip as Easy to Moderate. Fri 26 Apr 2019 - Tue 30 Apr 2019 Your trip can depart anytime between the above dates. Contact us for triple room requests and solo traveller prices. Wed 1 May 2019 - Fri 7 Jun 2019 Your trip can depart anytime between the above dates. Contact us for triple room requests and solo traveller prices. Sat 8 Jun 2019 - Mon 9 Sep 2019 Your trip can depart anytime between the above dates. Contact us for triple room requests and solo traveller prices. Tue 10 Sep 2019 - Thu 31 Oct 2019 Your trip can depart anytime between the above dates. Contact us for triple room requests and solo traveller prices.